Fandom In Stitches: All hail the Borg Queen! All hail the Borg Queen! Welcome back to another Star Trek pattern! This pattern is the Borg Queen from Star Trek, she appears in several episodes of The Next Generation and Voyager, and in the movie First Contact. 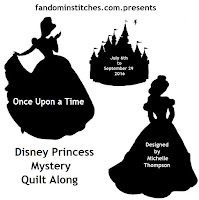 I have been working on this pattern for some time now, and have been delaying sharing it until the time was perfect. As all of you should know (shame on you if you don't), that it was our Fearless leader's birthday at the end of April. So what to do? The pattern is the perfect size for a wall hanging, but can easily be turned into a small quilt with some borders. Jennifer Ofenstein loves Star Trek just as much as I do, so this was the perfect gift to make. 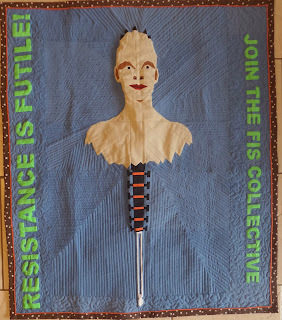 There is a bit of a tongue in cheek reference here, as I added the words on the sides, Resistance is futile, join the FIS collective. FIS stands for Fandom in Stitches. So what I tried to say here is Jennifer is our Borg Queen, who assimilates people into the collective. Once you join, you will never leave. Just for fun, I am including my video to Jennifer about the wall hanging and Jennifer's video where she shares the gift with us. Have an awesome crafty week.